In a career spanning almost half a century, soprano saxophonist Dave Liebman has appeared on more than five hundred recordings including seventy as leader of various groups. 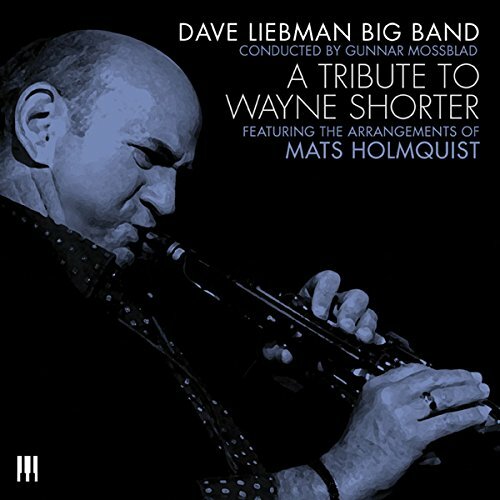 His latest, A Tribute to Wayne Shorter by the Dave Liebman Big Band, may well be the best one yet. Why? Because every single component, from choice of material to arrangements, performance to production, is no less than superlative. In other words, there is simply nothing on this brilliantly conceived and splendidly consummated album that warrants censure of any kind. In saluting one of the twentieth century’s most resourceful and respected jazz musicians, Liebman has chosen (wisely) to focus exclusively on Shorter’s more temperate and melodic treasure trove from the mid-1960s, a time during which he wrote such classic themes as “Infant Eyes,” “Nefertiti,” “Black Nile” and others. A second decision, perhaps even wiser than the first, was to assign arranging duties to Mats Holmquist, a Swedish master who leads his own ensemble and has literally written the book (well, a book) on big-band arranging, “Great Band ABZ.” Holmquist’s charts are, in a word, sublime, renovating Shorter’s compositions, originally designed for quartets or quintets, to make them seem as though they’d been written explicitly for full-size bands. A third decision, to open the album with a ballad (“Infant Eyes”), could have been less rewarding save for the excellence of the band, Holmquist’s wonderful arrangement, and bewitching solos by Liebman and pianist Jim Ridl. Liebman solos on every track, and the thought that arises after listening is “why isn’t this guy winning polls?” That’s no spur-of-the-moment impression; on soprano sax, Liebman is as sharp and perceptive as anyone you’d care to name. Pay heed, for example, to his dazzling sorties on the fast-paced “Black Nile” and “Yes or No.” Improvisation doesn’t get much better than that. Speaking of which, there are splendid solos along the way by guitarist Vic Juris (“Speak No Evil”), trombonist Tim Sessions and drummer Marko Marcinko (“Yes or No”), trombonist Jason Jackson (“Nefertiti”), alto / music director Gunnar Mossblad (“El Gaucho”), flugel Scott Reeves and bassist Tony Marino (“Iris”) and tenor Dave Riekenberg (“Black Nile”). In his liner notes, Liebman affirms “what a pleasure [it is] to play this timeless music with my big band.” The pleasure is ours, Dave. Five stars for Dave Liebman, the band, Mats Holmquist and especially Wayne Shorter whose singular talents made this superlative recording possible.